My first visit to Ballydehob wasn’t until around 1990. I remember being struck by how busy a place it was then – I only wish my memories from nearly 30 years ago were clearer. I now know, of course, that this vibrant little community has a history of being a cosmopolitan creative hub of the arts going right back to the middle of the last century. It’s a fascinating story, and Ballydehob is celebrating it by establishing an Arts Museum and permanent collection, with the first exhibition opening this week in Bank House: please come! Above: two batiks by Nora Golden. 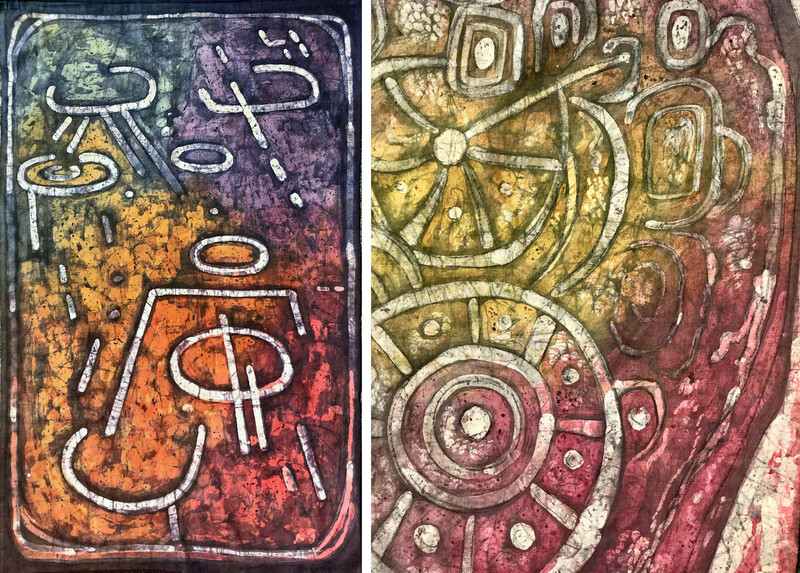 Left – The Rock of the Rings (rock art at Ballybane West) and right – detail from a work depicting Loughcrew-type passage grave art. 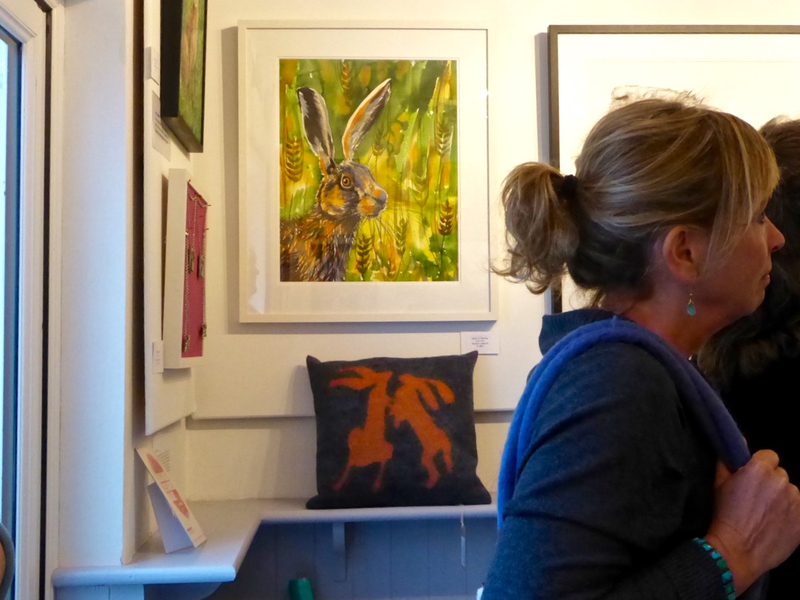 Nora and her partner, Christa Reichel were early arrivals on the arts scene in Ballydehob. 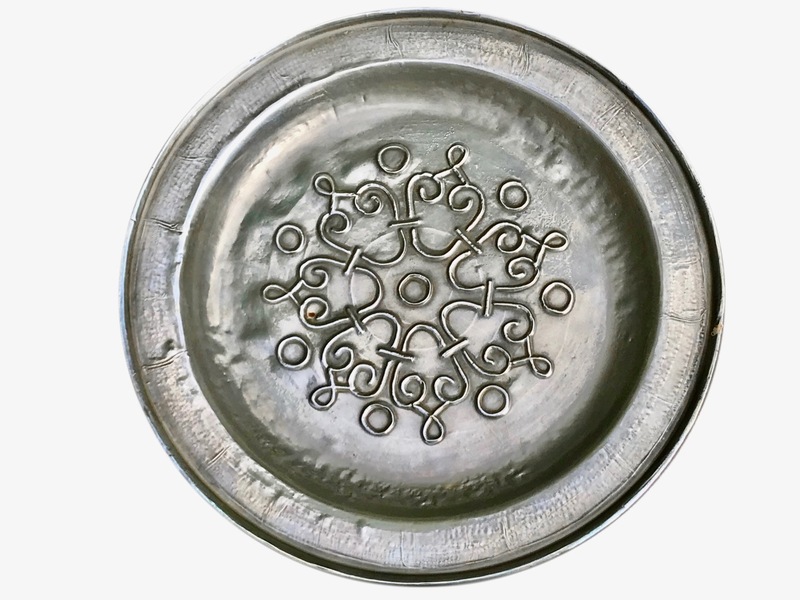 In the 1960s Christa bought a farmhouse and set up the region’s first studio pottery in Gurteenakilla then, with Nora, opened the ‘Flower House’ in the centre of the town: you can see it illustrated in the exhibition flyer at the bottom of this post. All this is well documented in the excellent book by Alison Ospina (herself a talented furniture maker) ‘West Cork Inspires’ (Stobart Davies, 2011). 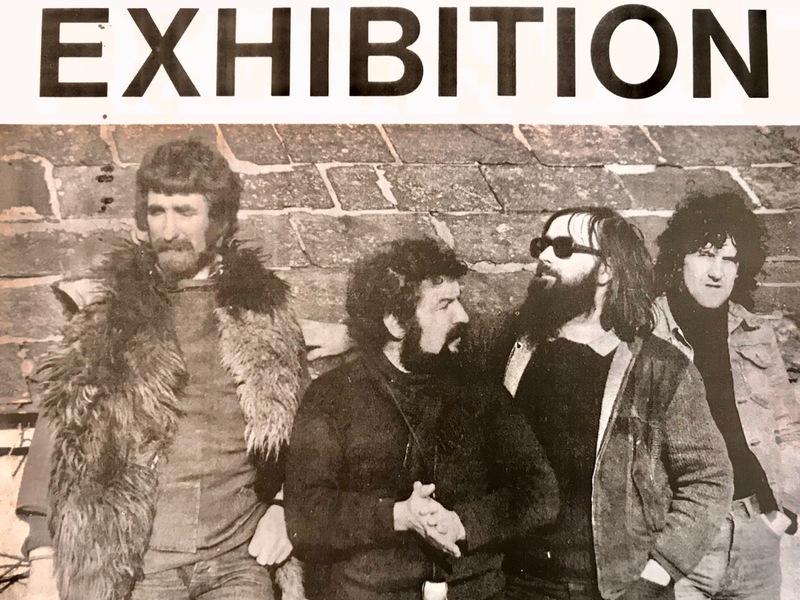 These denizens of 1970s Ballydehob are not a Heavy Metal band (to my knowledge) but in fact four important artists who had settled here: John Verling – artist, ceramicist and architect, Pat Connor – ceramic sculptor, Brian Lalor – artist, writer and printmaker, and David Chechovich – watercolourist. They are wearing the uniform of the time. 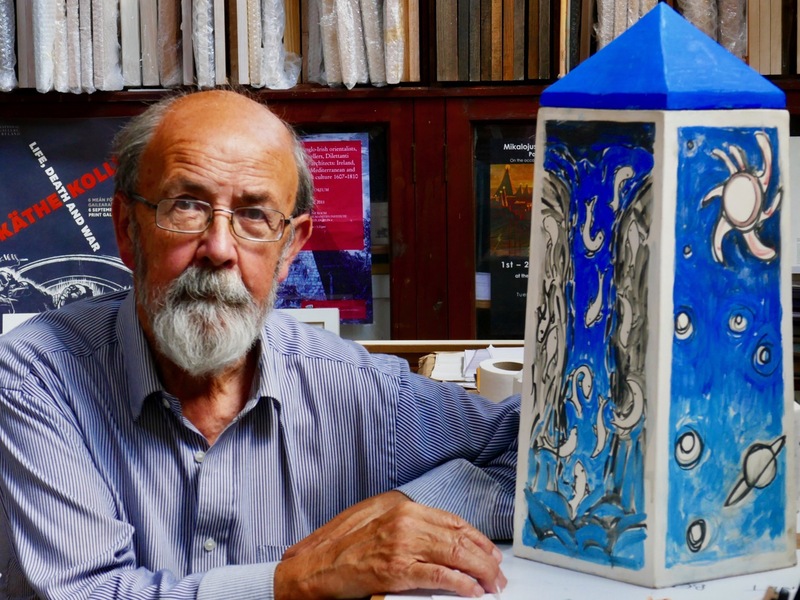 Here’s Brian Lalor in his studio today (photo by Finola) – you can certainly see the similarity . 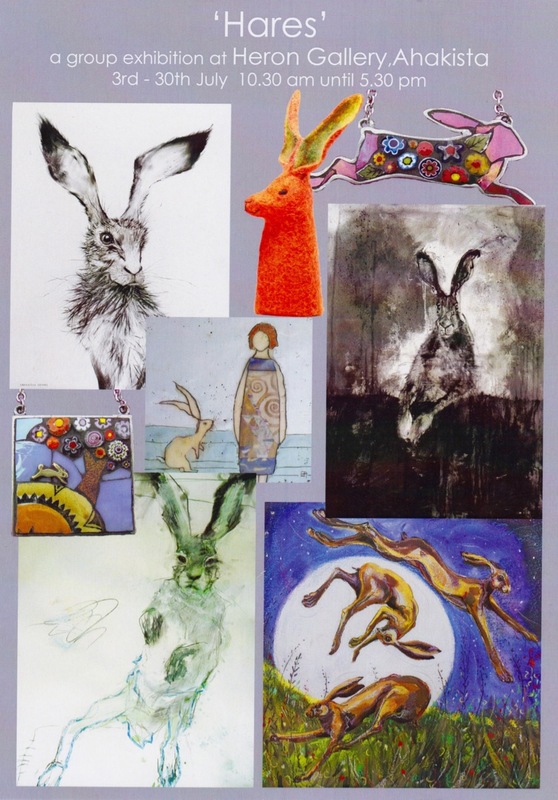 . .
Brian still lives near Ballydehob, and is the mastermind and Curator of the new collection. 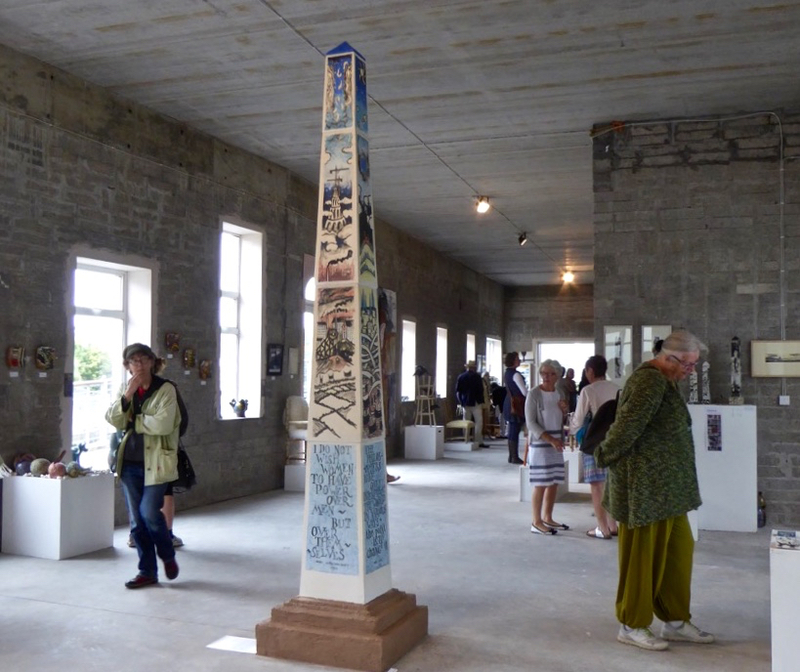 And, if you can begin to see it all fitting together, John Verling (on the right of Brian in the exhibition poster above) took over the Gurteenakilla Pottery with his wife Noelle and together produced striking ceramics, examples of which are in the header photograph. 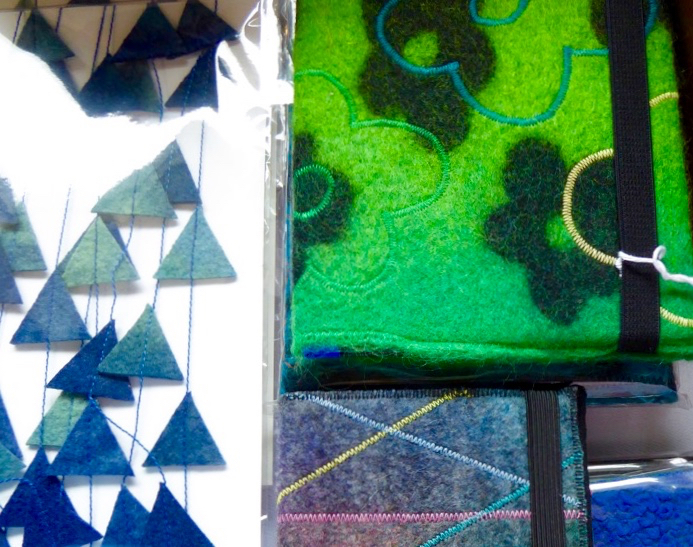 Gurteenakilla is lived in today by Angela Brady, an artist who works with fused glass. She is also an architect. And – she’s performing the most important task of opening the first exhibition in our new Arts Museum on Friday. 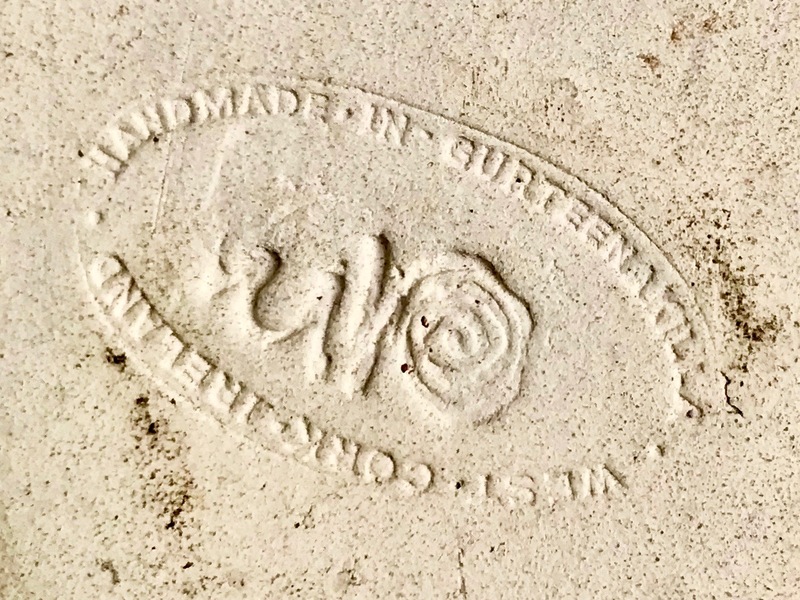 Finola wrote about Angela and other artists who contributed to the 7 Hands show on the pier in Ballydehob two years ago: have a look at her post and see if you recognise any other names. 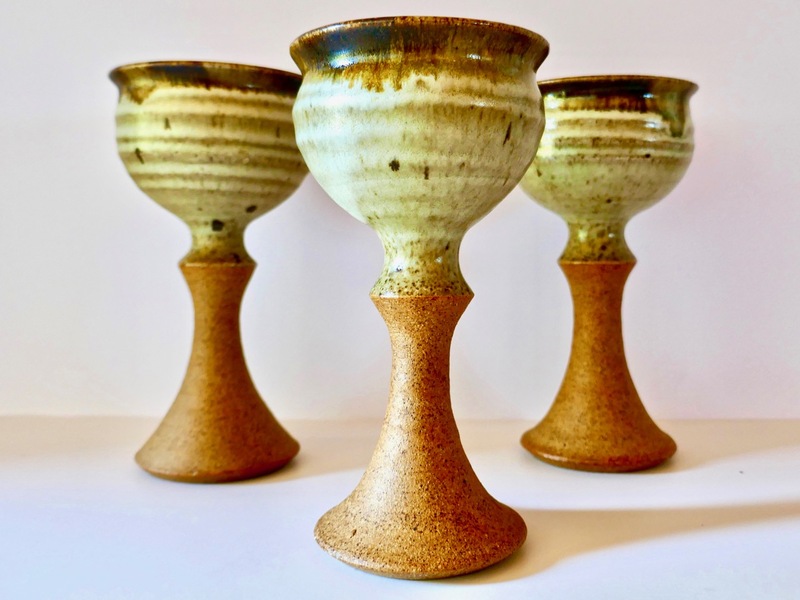 Beautiful stoneware goblets by Pat Connor, who is well represented in the collection. 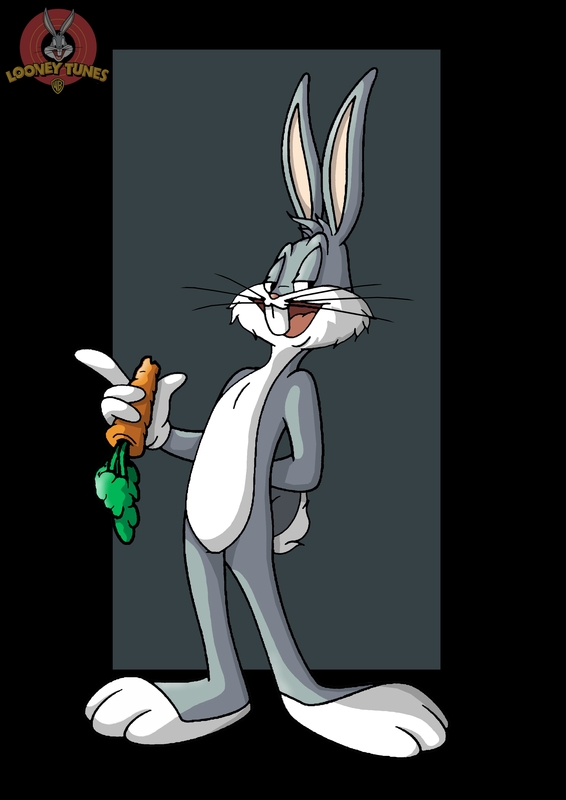 His maker’s mark is a memorable graphic. 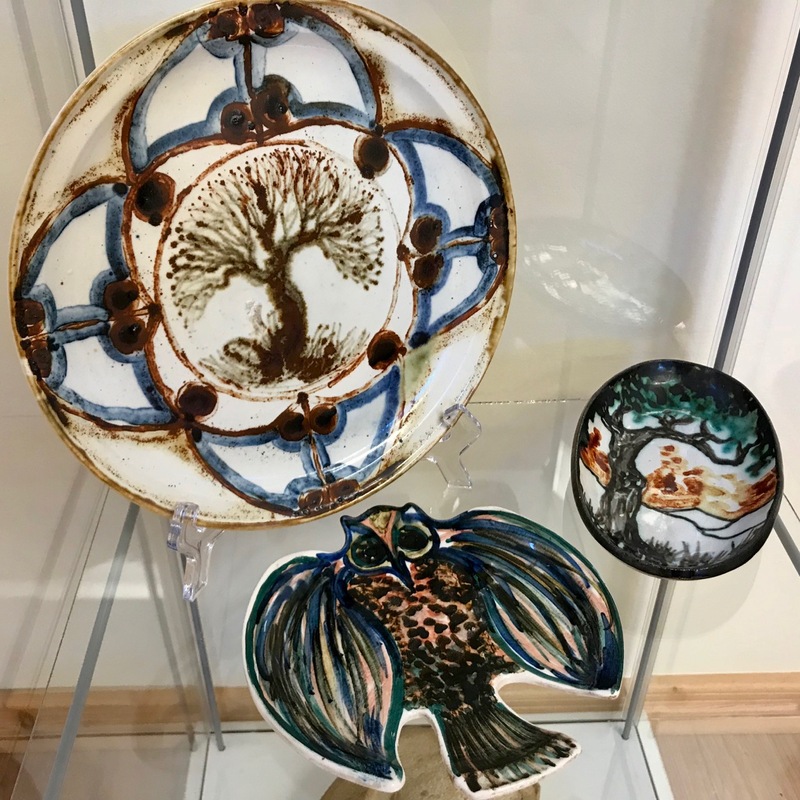 Another well known West Cork ceramicist represented here is Leda May, who with her husband Bob found Ballydehob in the late 1960s when they were invited by Christa Reichel to set up a pottery behind her own shop. 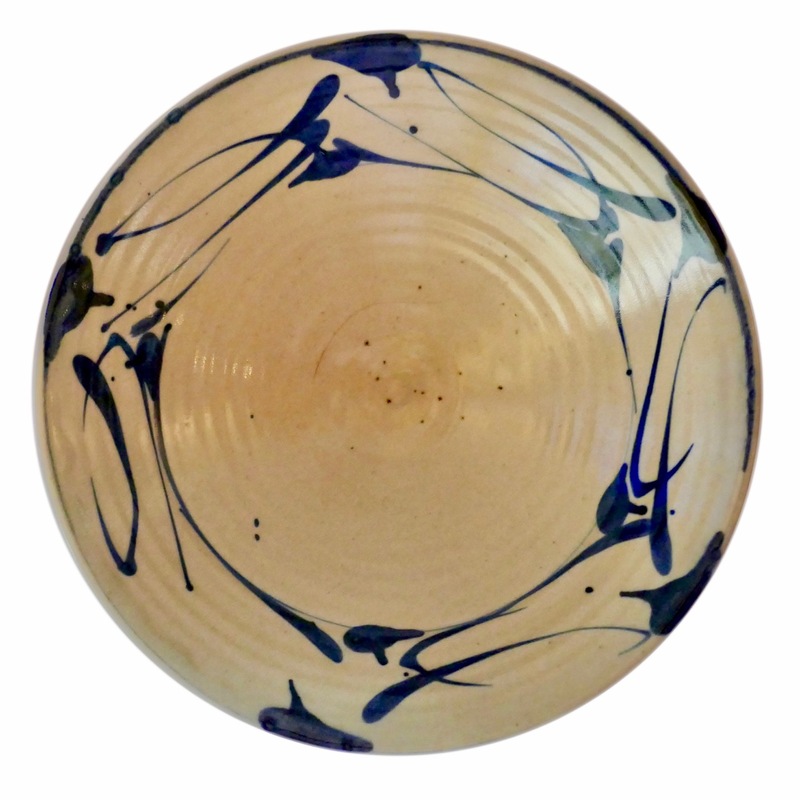 Leda is still working in the area today, producing very fine painted porcelain ware (an example of which is shown below). 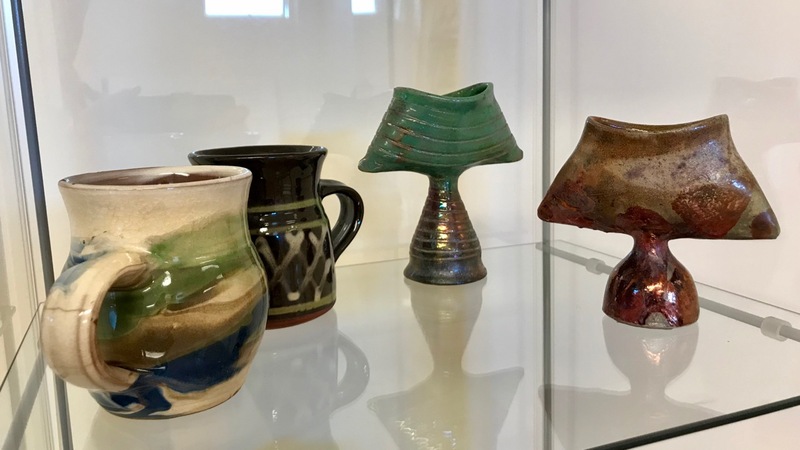 Above, from the exhibition – two earthenware mugs by Etain Hickey and Jim Turner, Rossmore Pottery 1983 and two Raku lustreware pieces by Jim Turner 1982. There are more stories to be told – to add to Alison’s comprehensive volume: the rise and fall of the Cork Craftsmans Guild, establishing the West Cork Arts Centre, exhibitions in far-flung places including Zurich, enigmatic repousee work – as yet we can’t trace its history . . . But all that is for another day, once the Ballydehob Arts Museum (BAM) is under way. 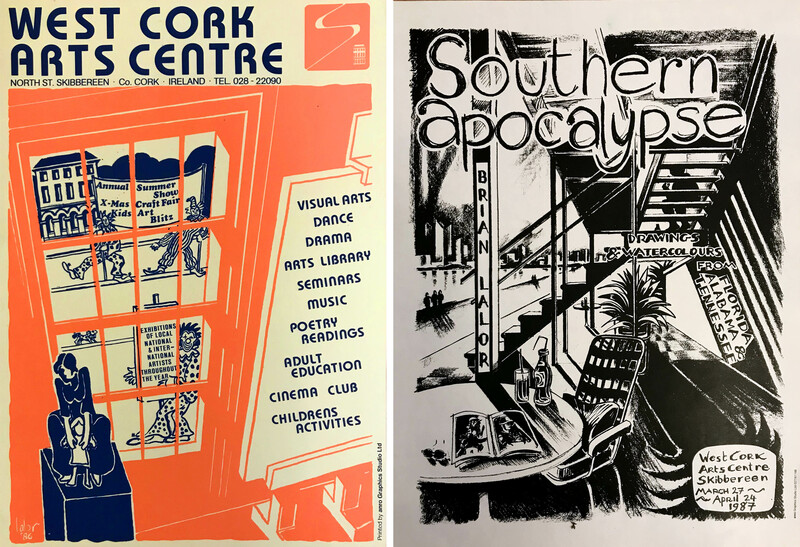 Below, posters by Brian Lalor and Repousee work by Shirley Day. So here’s yet another reason to come to West Cork! This ‘taster’ exhibition starts on 10 August and continues through Heritage Week and Ballydehob’s Summer Festival until 26 August. We have to commend our Community Council in Ballydehob who are giving us the space in Bank House – right in the town centre (the former AIB Bank building) which they acquired for the permanent enjoyment of the local community. Also we have benefitted from Cork County Council who have given us a grant under the Creative Ireland Programme to help get the whole project off the ground. And most of all we have to thank local people who have freely donated pieces for the permanent collection – all will be acknowledged when the Museum is up and running. 2015 was the Year of Irish Design. In celebration there were exhibitions, events, talks and programmes all across the country. RTE aired a four part documentary, Designing Ireland, introducing us to the history of design in this country. Hosted by Angela Brady and Sandra O’Connell this fascinating series took us from our roots in vernacular design and use of materials, through the dawn of modern design in Ireland via innovative architecture and fashion designers, to the heady days of the Kilkenny Design Centre and into the digital era where computer-based planning is married to mastery of materials by engineers, architects, fine crafters and designer-makers to produce products that can stand with any in the world. 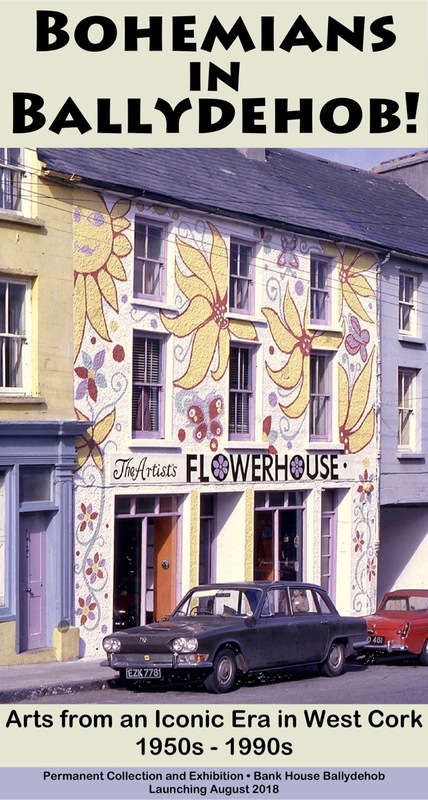 Artists and craft people gravitated towards West Cork throughout the second half of the 20th century for the light, the distance from civilization, the beauty of the countryside, the affordability of land for studios and housing and for the support of a community of like-minded individuals. Alison Ospina, in her book West Cork Inspires, describes this period and profiles many of the practitioners who discovered this unique area, drew inspiration from it and made their home here. 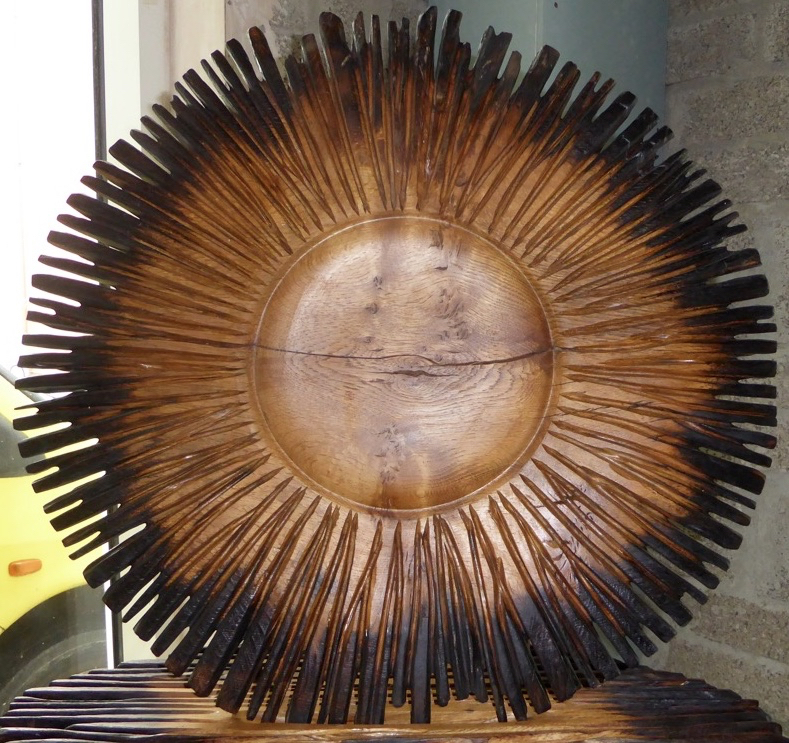 Last summer in Ballydehob the 7 HANDS Group harkened back to this golden era of West Cork Design with a stunning exhibition of contemporary fine craftwork by seven local artists. 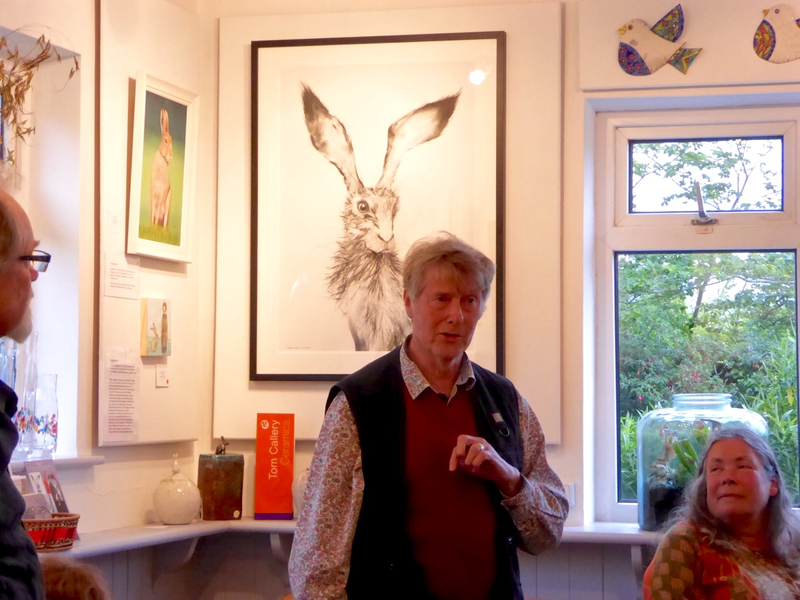 The exhibition moved on to Dublin and London where it was well received, although I cannot imagine the settings there could rival that of our tiny pristine Haugaard Gallery on the Pier in Ballydehob. 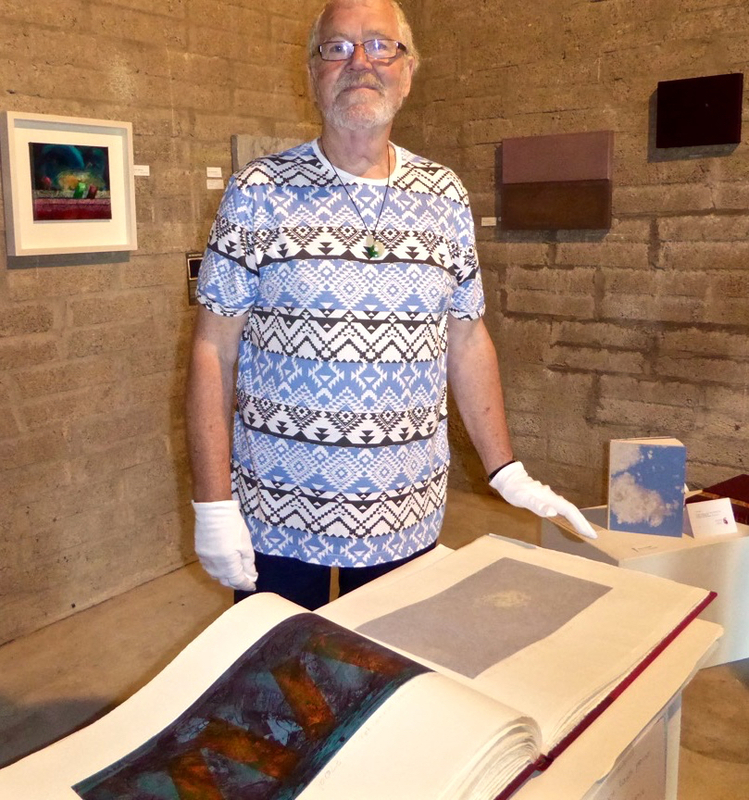 The exhibition was supported by a series of artists’ talks and it was quite magical to listen to Brian Lalor talk about the detail and precision of his etching process, compared to Alison Ospina’s approach to her greenwood chair building in which the material reveals the ultimate design to her. Angela Brady walked us through the making one of her luminous glass creations (those gorgeous beetles!) and Paddy McCormack spoke about the fiery furnace in which his wonderful chess set was forged. 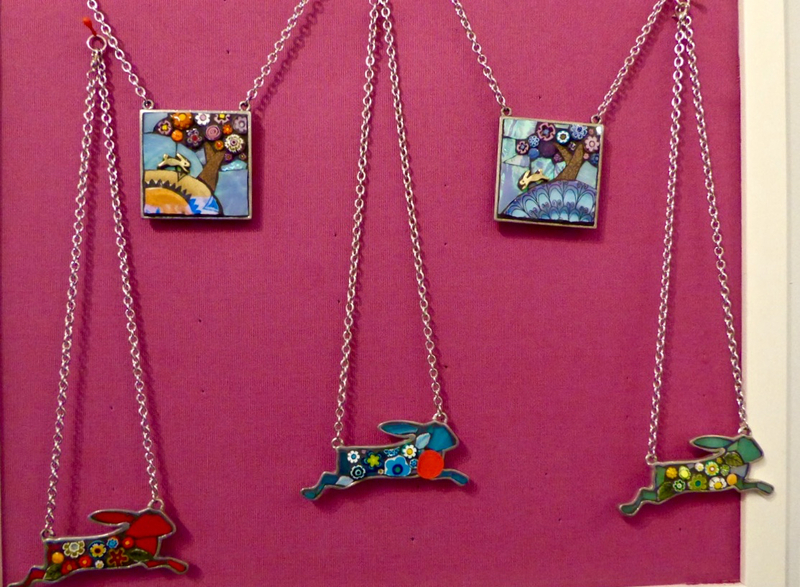 We came away with our own little souvenir – yet more hares for Robert, this time by Etain Hickey. The 7 HANDS group has larger ambitions. 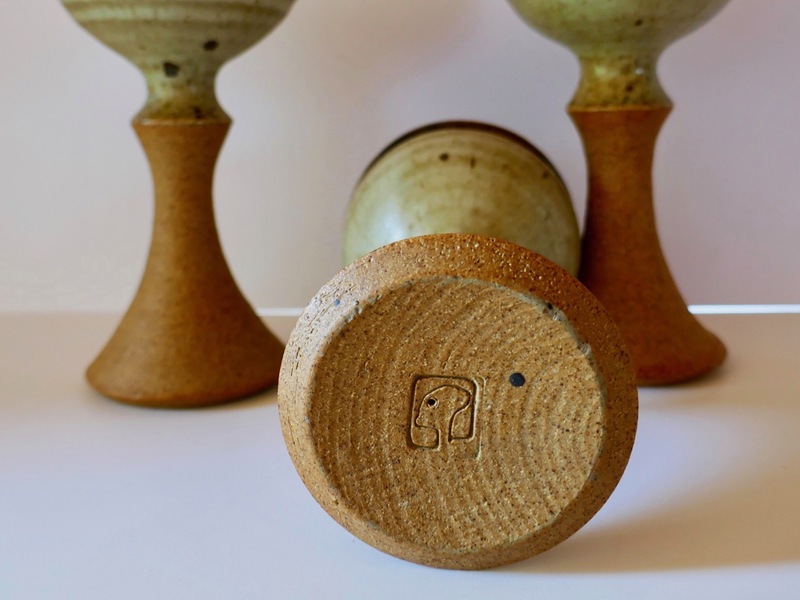 They want to re-establish West Cork’s place in the Irish design and craft pantheon. With this, their first exhibition, they have made an excellent start. *A special thank you to Angela Brady for some of the photographs in this post.